These benefits of omega 3 fatty acids will motivate you to eat foods rich in essential fatty acids. Omega 3 fats are present in oily fish such as salmon, tuna, sardines, mackerel and herring. Plant sources include flaxseeds, walnuts, and soybean. 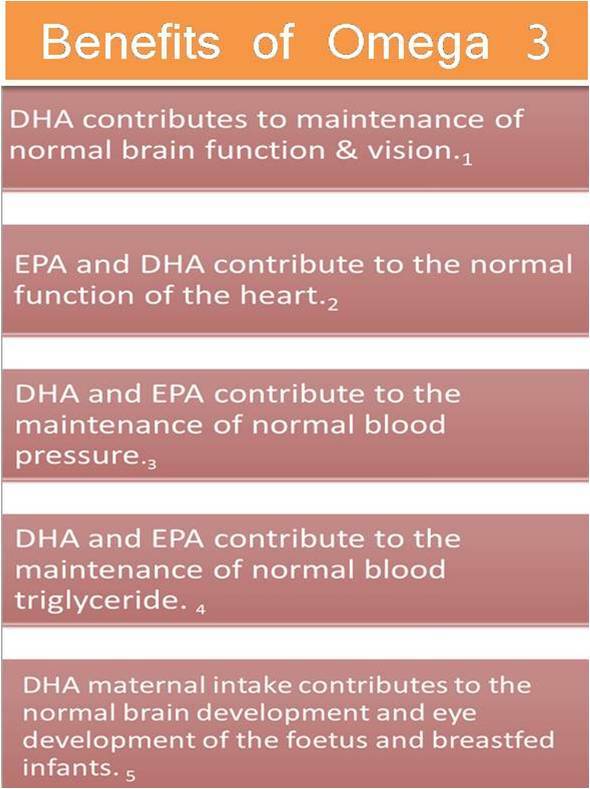 Omega 3 play a major role in improving heart health, brain function, and normal growth and development. The benefits of omega 3s are realized by lowering blood cholesterol levels and reducing arterial damage by their anti-inflammatory action. In addition, they lower the LDL (bad) cholesterol level, increase the HDL (good) cholesterol, and decrease the platelet adhesiveness (that leads to clot formation). In the absence of polyunsaturated omega-3s, your body has to use saturated fats in its cell membranes, resulting in less elastic membranes. This condition can have a negative effect on the heart muscle, by making it harder for the heart muscle to return to a resting state (relaxed state). Cardiac arrhythmias, which can lead to sudden cardiac death, is less common among people who consume omega-3s on a regular basis. Omega-3s decrease the rate of plaque growth in the arterial lining. The benefits of omega 3s have been shown by studies of heart attack survivors which have found that daily omega-3 supplements dramatically reduce the risk of death, subsequent heart attacks, and strokes. Likewise, people who eat an ALA-rich diet are less likely to suffer a fatal heart attack. Strong evidence from population-based studies suggests that omega-3s (primarily from fish) help protect against strokes caused by plaque buildup and blood clots in the arteries. In fact, eating at least two fish servings per week has been shown to reduce the risk of stroke by as much as 50 percent. Nevertheless, people who eat more than three grams of omega-3s per day (equivalent to 3 fish servings per day) may be at an increased risk for hemorrhagic stroke, a potentially fatal type of stroke in which a brain artery ruptures or leaks. Please note that a combination of high omega-3s and other blood thinners may increase bleeding risk, especially in the elderly population with weak, brittle arterial linings. Omega-3s seem to improve rheumatoid arthritis, diabetes mellitus, psoriasis symptoms, and increase the life span of people with autoimmune diseases- due to their anti-inflammatory properties. They also improve insulin sensitivity. The human body can convert EPA and DHA to natural anti-inflammatory substances called prostaglandin and leukotrienes that decrease inflammation and pain. People on high omega-3 diets have less joint stiffness, swelling, tenderness, and overall fatigue. Omega-3s also reduce the amount of pain medications needed by these patients. Large-scale studies have discovered that people who consume more omega-3s have lower blood pressure readings. Avoid certain fish sources (such as tuna) that are high in mercury, since mercury has been shown to increase blood pressure. If someone says you have a fat brain, they literally are speaking the truth because sixty percent of your brain contains fatty tissue. The brain cell membranes are rich in omega-3s. In fact, the omega-3s (especially the EPA & DHA) are believed to keep the brain's entire traffic pattern of thoughts, reactions, and reflexes running smoothly and efficiently. When the brain cells cannot get enough omega-3s, they have to use other fatty acids as part of their membranes, making both of them less functional. Further, the benefits of omega 3s are evident in reducing symptoms of depression, dementia, general anxiety, schizophrenia, and mood disorders. They also improve cognitive and behavioral functions. Omega-3s are vital for infant’s health. Pregnant mothers, who do not consume enough omega-3s, increase the potential risk of vision and nerve problems in their unborn babies. Asthma is a major health concern today. Research finding revealed that there were low cases of asthma among Eskinos because of their high consumption of oily fatty fish that are rich in EPA and DHA. Basic research proposes that omega 3s influence the inflammatory process substances that are involved with asthma.